Grumpy loves spaghetti. He loves spaghetti with cottage cheese on the side. Me, I never had it that way and as a kid I hated spaghetti. So, as an adult, until about the last 3 years or so, I never wanted to eat pasta of any kind. Then, something magical happened and I realized I LOVE pasta. Now, I even will crave spaghetti! However, I still don’t eat it with cottage cheese but I make sure I have it (most of the time) when I am serving it to Grumpy. You should have heard him tonight as he was serving up his pasta dish. “Ohh, there’s cottage cheese in the fridge.” LOL, you would have thought he had struck gold! Isn’t it funny the simple things that can please us? My original plans were to make a homemade spaghetti sauce. I came home and started it up, got as far as dumping the can of diced tomatoes in the pan with the meat and realized I may have been wrong about having tomato paste in my cupboard when I searched high and low and couldn’t find any! So, I ended up having to improvise, and let me tell you, that improvisation turned out to be really tasty and even Grumpy commented on how good it was! This is my post for this week’s Presto Pasta Nights where I am also the host for this week! 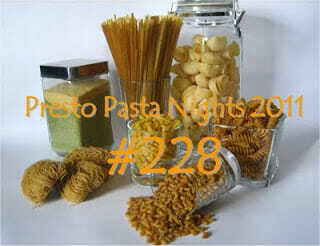 Presto Pasta Nights was founded by Ruth of Once Upon a Feast and is an event that has run for quite a long time now. That means it is a fabulous event! You still have time to participate if you want as the deadline to send me your post and photo is not until the end of the day on Thursday, August 25, 2011. If you would like to join in, check out the link above this post for the instructions on how to participate. Come back Friday for the round up post to see what delicious pasta meals we have all been making this week! Whole wheat pasta, cooked according to package directions and tossed with a slight amount of olive oil after draining to prevent sticking. Saute prosciutto until fat is rendered and meat begins to brown. Add onion and red peppers and saute until onions are translucent, about 2-3 minutes. Add ground beef to pan and cook until no longer pink. Add can of diced tomatoes and simmer about 5 minutes. Add Prego sauce and bring to a boil. Turn heat down and simmer. Add salt, sugar and red pepper flakes. Simmer, uncovered about 7-8 minutes to reduce liquid and thicken sauce. Serve over pasta and enjoy! When I was a kid I loved spaghetti with ketchup. Sshh but sometimes I still do. I'm really into quinoa pasta lately… have you ever tried it? 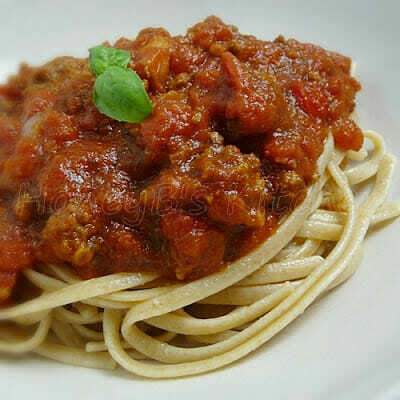 When I was a kid my mom made spaghetti with meat sauce that everyone loved… everyone but me. I preferred the greasy spoon diner version. It always annoyed her. Thanks for hosting Presto Pasta Nights this week. I didn't get a chance to make any myself, but I'm looking forward to the roundup. Mmmm! Loving that thick hearty sauce! Oh boy… hosting presto pasta… good for you! 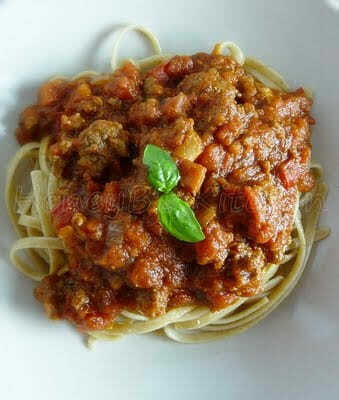 I am huge fan of past and sauce – if i could i would eat it every day 🙂 nice recipe. mmmm, that's the kind of dish i could just slurp up! delish!